Pokédex Entry- It is known as a herald of a true catastrophe, only emerging to humans when a cataclysmic event is about to occur. It is said the red markings on its body are its eyes. Its tail has evolved to become long and whip-like, with a scythe on the end. When angered, it decapitates and dismembers its enemies with ease. Evolution Method- Lvl up near/in a disaster. 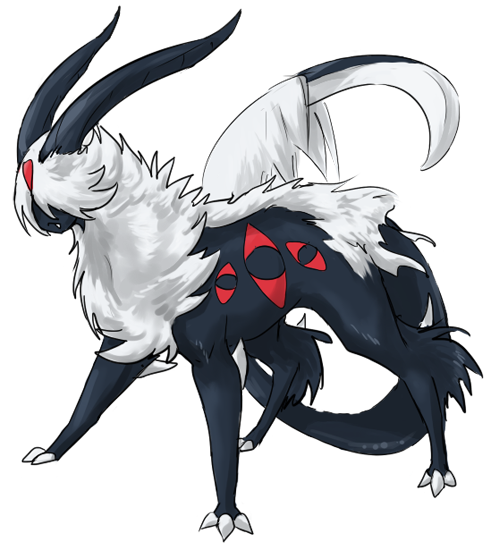 I know his design is a little odd, but after researching Absol's origins -there are many @_@- I came to find that its probable main inspiration was a man-faced goat that kind of worked like a demonic ominous presence. Kinda like the Grim in English folklore, except instead of just a messenger, this guy's a little more sinister. Needless to say, I incorporated a lot more of its traditional features into the design. Also scythes. I also tweaked the stat build to be similar, but not the same and overall lower than Mega Absol to keep Mega Absol's validity.